There are five different ascension gifts of apostles, prophets, evangelists, pastors, and teachers. All of these have a different anointing for a different purpose. When you understand the differences, you can benefit from the differences. This course will focus on the apostle’s grace, the apostolic model of ministry, transitioning into an apostolic structure, how Apostle Paul built an apostolic church and a dominant apostolic team, and how the Holy Spirit empowers you to enter the sent one apostolic dimension. Welcome to the Understanding Apostolic Ministry and what it means to you eLearning course. Apostles see the church as the seat of governing authority, equip teams of sent ones, empower sons and daughters, and prepare believers for victory in high-level spiritual warfare and advancing the Kingdom of God. There are several words that best describe the apostles grace that you will experience including, build, restore, govern, and father. In this course, we start to develop these concepts which prepare you to mature in the ways of the Holy Spirit. I’m excited you want to learn these truths. As you embrace an apostolic identity, you can participate in the restoration of all things, Christ's ministry as restoring king, and the royal priesthood of kings. Apostolic grace is different than pastoring grace. Most of us were raised in pastoral-only churches. This has hindered our spiritual growth, maturity, vision, spiritual strength, and ability to manifest the Kingdom of God. This course will help you see things you have not seen before. The pattern for effective ministry has been rediscovered. A new move of the Holy Spirit has begun. It's called the apostolic revolution. The Holy Spirit used it to pioneer the most significant spiritual revolution of all time. Now you too can learn His truths. Now you can find your place in this God's eternal purpose for your life and ministry. This is the best apostolic foundational material that we could put together. You will not be disappointed. Get started today! Rediscover the forgotten model of ministry the Holy Spirit used to turn the world upside down. Understand why the Holy Ghost used believers to launch the greatest revolution of all time. Learn why traditional ministry models are collapsing and what will replace them. Know why apostolic believers think they can take over the world. How to identify apostolic prototype ministries in your city. Why you need a spiritual father, the seven benefits, and how to find one. Learn how to live through trouble and have fun. 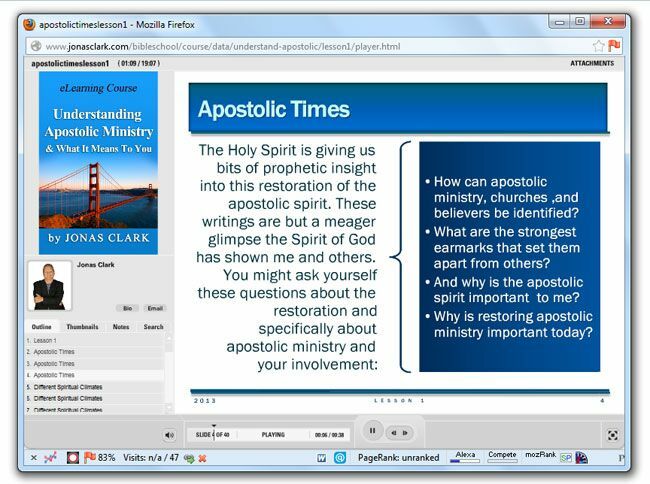 Understanding Apostolic Ministry online ministry training course includes thirty-four apostolic class lessons, audio teachings, and reading reading assignments to help you catch the spirit of the module with online quizzes that monitor your progress and understanding of each lesson.